When you invest in, or loan money to, a company, you want to ensure that the company will own the intellectual property you believe it has at the time of the investment or loan or that is subsequently created by the company’s founders and employees with your money. The value of your investment or the security of your loan may depend on this intellectual property. Attorneys can prepare contracts that assign ownership of this intellectual property from the founders and employees to the company or that grant security interests in the intellectual property, but these contracts are only half of what’s needed. What if the company’s founders and employees leave the company? What if they take source code, confidential documents, trade secrets, inventions, data, encryption keys, and other proprietary materials with them? What if they only leave outdated materials (or nothing) behind? What if they claim that they developed, created or invented these things after they left and that, therefore, the contracts they signed don’t apply to the “new” intellectual property? How do you establish what the company owns or what the security interests apply to? How do you protect your investment or loan that depends on the intellectual property that you relied on in making your decision to invest or lend, or that is subsequently created with your money? 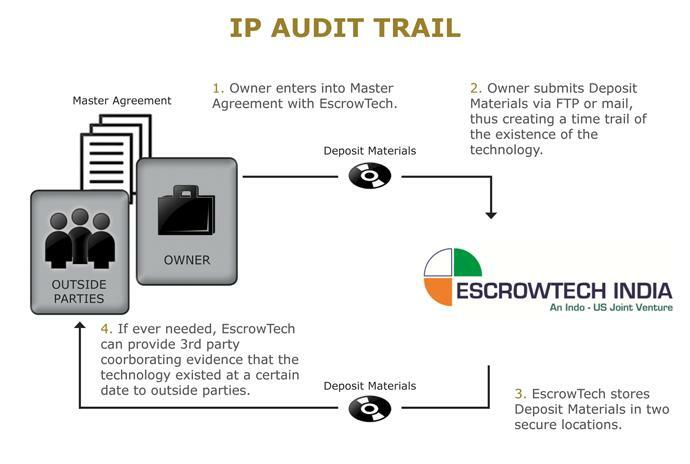 EscrowTech India’s IP (Intellectual Property) Collateral and Investment Protection services provide the solution by documenting and securely storing embodiments of the intellectual property covered by the contracts you are relying on. This service provides dated, independent corroboration of what the company owns, and allows for access to and retrieval of this intellectual property if and when needed. Computer programs (including source code and development environments), confidential documents, invention disclosures, drawings, prototypes, samples, formulas, data, encryption keys, and any other embodiment of intellectual property can be deposited with EscrowTech India in a depository dedicated to the protection of you, the investor or lender. Periodic deposits of these materials create an independently corroborated audit trail of the intellectual property.